Apple growers should increase the amount of flowers around their apple orchards if they want to increase their harvest. A new study by researchers from Stockholm University, among others, shows that more pollinators, such as bees and flower flies, are attracted to orchards with flowers – which increase the chance for pollination. This summer's apple harvest set record highs and there were large expansions of organically produced apples. New research studying apple orchards in Sweden, Germany and Spain, published in the Journal of Applied Ecology, found that wild pollinators and pollination were higher in orchards with more flowering plants. "However, many orchards do not contain high numbers of flowering plants. Growers could benefit from changing this," says Peter Hambäck, professor at the Department of Ecology, Environment and Plant Sciences at Stockholm University. Improved pollination generates more seeds, which may increase possible storage time for certain crops. Researchers believe that by generating more seeds in individual apples, thus changing the mineral content, apples can be stored longer. Increasing the amount of time apples can be stored after harvest has great advantages for apple growers, but more studies are needed to further investigate this link between pollination and seed production. 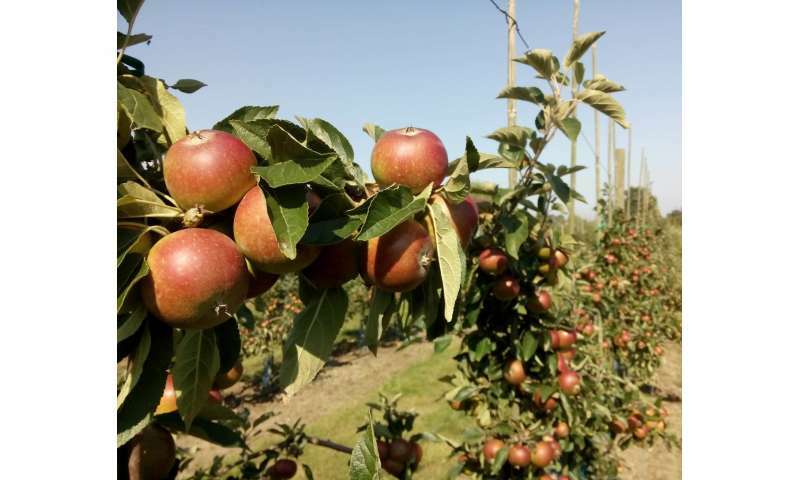 The study showed that the average production of apples in organic orchards is lower than in orchards utilising chemical pesticides for plant protection. "Yet, a surprising result in the study was that the organic orchard with the highest production had considerably higher production than the average of the orchards using chemical pesticides. This shows us that there is a potential to develop more environmentally friendly cultivations and at the same time obtain a high harvest," says Peter Hambäck. "Organic orchards have as expected, a higher biodiversity, which means that they have more pollinators and predatory insects. A higher apple production however, does not impede a high biodiversity. Growers wishing to increase their apple production should allow wild flowers to grow in their orchards," says Peter Hambäck.